Es Tresidder has confirmed his intention to race at the inaugural True Mountain Lakes Sky Ultra™. Speaking with Charles Sproson, Race Director and course planner, Es said “The True Mountain Lakes Sky Ultra™ takes in some of the best and most challenging terrain that the Lake District has to offer. After doing a few amazing SkyRaces elsewhere in Europe, I’m really excited to see this sort of ultra-race, incorporating rough and technical ground, come to England. Tresidder has long been a strong mover in the mountains, having grown up in a mountaineering family. At the tender age of 16, Tresidder turned up in Snowdonia and bashed out a cracking time round the Snowdon Horseshoe of 1:41. This laid the foundations for Es to push his boundaries and over the years he has put in some incredible performances in the mountains. Finally, in 2009, Es had the opportunity to fully test his mettle on the Snowdon Horseshoe. Coupled with good luck from the weather gods and with running conditions just right, he laid down an FKT, taking in the summits of Crib Goch, Crib Y Ddysgl, Snowdon, Lliwedd W Summit and Lliwedd E summit returning to Pen Y Pass. The time: 1:25.08. It’s a time to stands to this day. 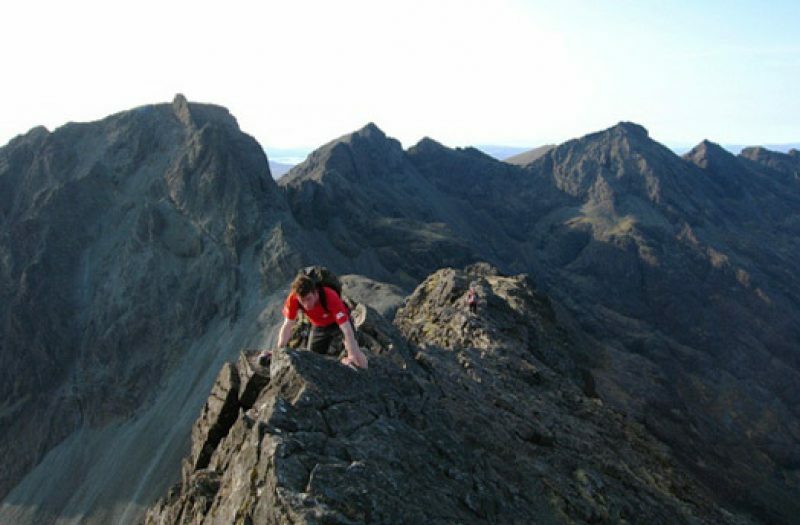 A few years previously, on Saturday 5th May 2007, Es had spent the previous evening bivvying out on the Cuillin Ridge. A week earlier he had put in an attempt on the record, but in the heat of the midday sun had struggled for enough water. This time he had a water bag taken up to the Inaccessible Pinnacle, and with an earlier start to the day, Es was hoping to avoid the worst of the sunshine. Dawn broke, and Es found himself high above a temperature inversion. A perfect day to be on the Cuillin Ridge, never mind what he was about to attempt. “The day turned out to be one of the most spectacular I’ve ever seen. The valley was slowly enveloped in a sea of mist, leaving the ridge the only thing floating above in the sunshine. It was like running in heaven,” writes Es on his blog Es On Ice. Soon enough, Es had completed his traverse. The time on his watch 3:17. He had done it, breaking Andy Hyslop’s previous record of 3:32. All that was required now was the long hitch hike home. Amazingly this time of 3:17 has now been dropped sub 3 hours but that’s a story for another day. 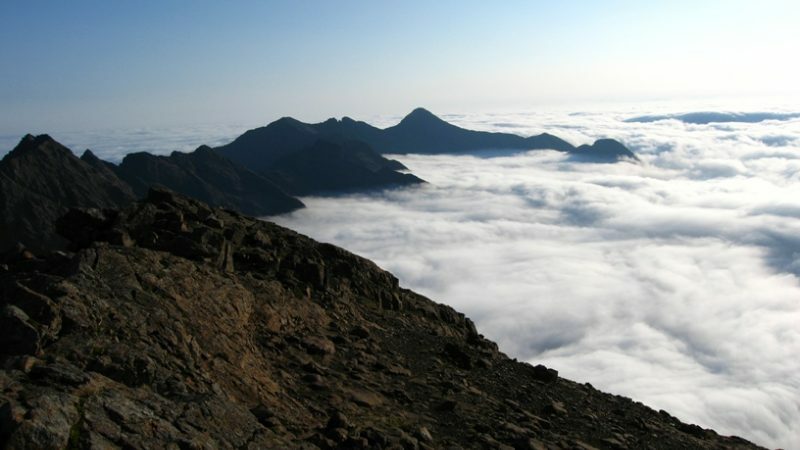 If ever there was a scene to convey SkyRunning’s mantra ‘Less Cloud, More Sky’ this is it. 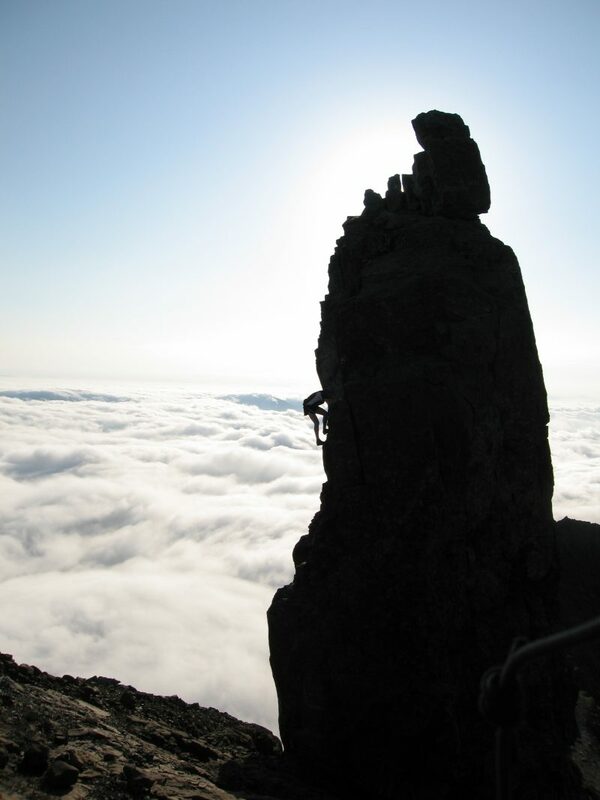 Es down-climbing The Inaccessible Pinnacle on his record breaking run. After several years completing a Doctorate in Environmental Architecture, and with being based in Belgium, the mountains have been a little far away for Tresidder. However, the 2014 summer season was about re-finding his form. Es scored 8th place at the Matterhorn Ultraks 46k, and 9th at the Giir Di Mont. Not too shabby in a come-back year. His goals for 2015 include the Scottish Island Peaks Race (Es’s team, sailing on ‘Obedient’ took top honours), Giir Di Mont, Glencoe Skyline, Els2900, and of course the True Mountain Lakes Sky Ultra™. Charles and Andrew both wish Es the best of British for his summer training and racing and will look forward to watching him race at the True Mountain Lakes Sky Ultra™.